Objective: Diversion of excess prescription opioids contributes to the opioid epidemic. 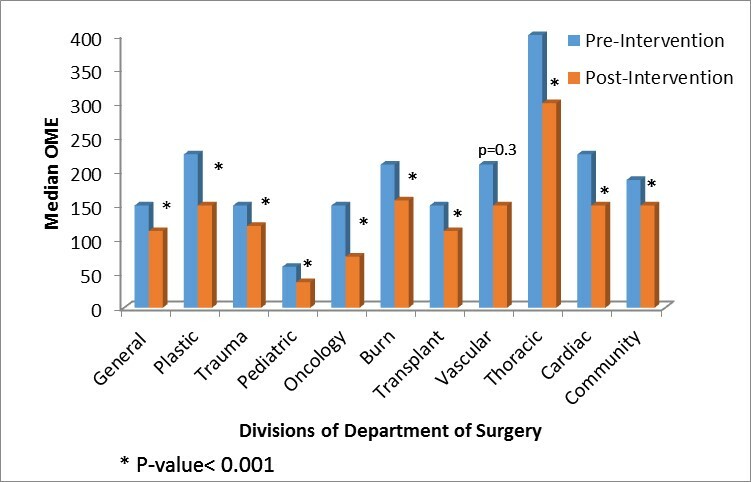 We sought to describe and study the impact of a comprehensive departmental intervention to decrease opioid prescribing in surgery. Methods: A multi-specialty multidisciplinary intervention was designed to change the culture of postoperative opioid prescribing, including: 1) consensus-built opioid guidelines for 42 procedures from 11 specialties, 2) provider-focused posters displayed in all surgical units, 3) patient opioid/pain brochures setting expectations, and 4) educational seminars to residents, advanced practice providers, and nurses. Pre- (April 2016-March 2017) vs. post-intervention (April 2017-May 2018) analyses of opioid prescribing at discharge [median oral morphine equivalent (OME)] were performed at the specialty, prescriber, patient and procedure levels. Refill prescriptions within 3 months were also studied. Results: A total of 23,298 patients were included (11,983 pre-; 11,315 post-intervention). Post-intervention, the median OME significantly decreased for 10 specialties (figure 1, all p-values <0.001), the percentage of patients discharged without opioids increased from 35.7% to 52.5% (p<0.001), and there was no change in opioids refills (0.07% vs 0.08%, p=0.9). Similar significant decreases in OME were observed when the analyses were performed at the provider and individual procedure levels. Patient-level analyses showed that the pre-intervention race/gender disparities in opioid prescribing disappeared post-intervention. Conclusions: We thus describe a comprehensive multi-specialty intervention that successfully reduced prescribed opioids without increase in refills and decreased gender/race prescription disparities.